The unique structure that is now known as the Robbers Roost Bookstore, was lovingly hand-built in 1976 as the home of life-long nature lovers and Utah enthusiasts Ward and Gloria Roylance. With no prior homebuilding or construction experience, this intrepid and innovative couple built their dream home entirely by themselves, at a time most folks their age were sedately enjoying retirement! Heavy Engelmann Spruce bemas, hand-cut and trucked down fromt eh top of Boulder Mountain, were laboriously lifted in place as supports for the many 2-inch thick planks which, one by one, were secured using thousands of 16-penny hand-hammered nails, eventually resulting in teh unique Tepee-Style home enjoyed today. The couple collec`ted and artfully installed the interesting rockwork seen embedded in the walls. The wood stove is the only source of heat during many cold winters. The outdoor landscaping you see today i slargely a result of their efforts. Throughout his life Ward labored in many professions, including trying his hand at writing about the land he loved. His works have been out of print for many years but you are welcome to browse a copy available at the counter at the bookstore. 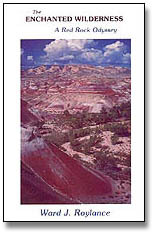 "Ward and Gloria Roylance have made their home in the Fremont River Valley near Capitol Reef National Park since 1976. There, on a frontier between high, forested plateaus and the redrock Canyonlands wilderness. they observe and experience nature in its relatively pristine aspects." "Mr. Roylance is a Utah specialist, having devoted most of his working life to traveling, writing about, and photographing that extraordinary place. Some 20 years ago he and Gloria became enamored with the Colorado Plateau province of the Four Corners states, to which they applied the name Enchanted Wilderness." "In this book they convey their love and concern for this marvelous, fragile part of our planet, the largest wild or near-wild province still remaining in the 48 contiguous states. Because of its uniqueness, they say, the region deserves the most enlightened consideration." "This book is a love story that began more than forty years ago with my first journey to the red-rock country of southeastern Utah. The infatuation that saw its beginnings there at Dead Horse Point expanded to include the State of Utah. Eventually, joined in this infatuation by my dear companion Gloria, my love affair grew to embrace the entire Colorado Plateau - the marvelous Enchanted Wilderness - of the Four Corner states." "Despite its remarkable concentration of national parks and monuments, state parks, national forests and recreation areas, and Indian reservations, the Plateau as an integrated region of natural wonders beyond comprehension is not known to the public at large. Not being known, it is not appreciated as a region and its destiny is of little concern to the general public. Its fate is being decided by uninspired officials, politicians and special interests, few of whom have an enlightened vision of WHAT SHOULD BE and WHAT MIGHT BE." 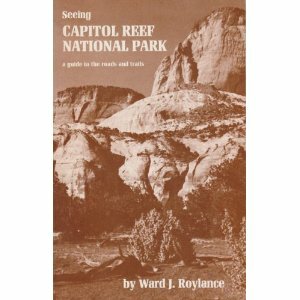 This book is one of my most treasured possessions and I highly recommend it to anyone interested in Red Rock Country. Unfortunately, it’s also one of the hardest books on this list to find. It’s been out of print for years and I’m not really sure where you can still find copies. I occasionally come across a copy or two in one of the shops around Moab, but even that has become a rarity. If you ever see a copy of this book, BUY IT and SHARE IT! Check out my Art in Stone page for a collection of excepts from this wonderful book.